In 1931 the Denver & Rio Grande Western's route from Denver to Grand Junction involved a long detour south to Pueblo, a steep climb northwest past Leadville to Tennessee Pass, and a steep drop from there to the Eagle River at Minturn, after which grades were relatively mild. 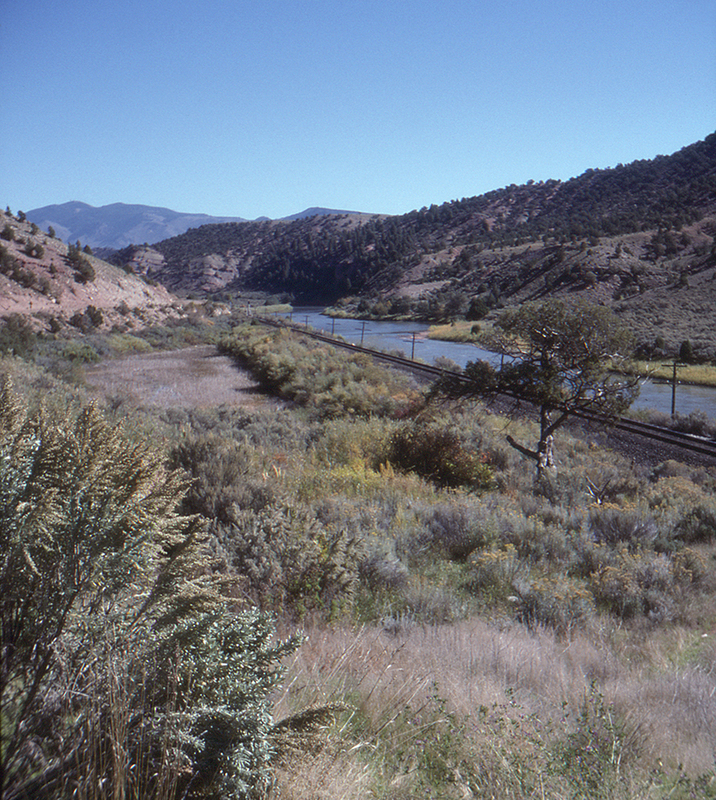 In that year the Rio Grande acquired rights to build a cutoff from a location east of Glenwood Springs along the Colorado River (Dotsero) to a connection with the Denver & Salt Lake (Moffat Road) at Orestod, near Bond. Built in the 1930s, to a considerable extent with funds from a Reconstruction Finance Corporation loan, the Dotsero Cutoff finally put the Moffat Tunnel on a mainline between Denver and Salt Lake, saving the Rio Grande many route-miles compared to the Tennessee Pass route via Pueblo. Fall on the Cutoff is a spectacular time of year, as this view north of Burns, Colorado attests. This page posted 3/1/2019. Text and photo ©2019 Lamont Downs.